[02-Jan-12] Tiny solid and liquid particles suspended in the atmosphere are called aerosols. These particles are important because they represent an area of great uncertainty in research that aims to understand Earth's climate system. 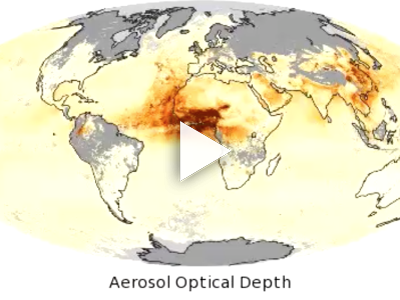 These maps show monthly aerosol optical thickness, derived using measurements from the Moderate Resolution Imaging Spectroradiometer (MODIS) sensor onboard NASA's Aqua satellite from 2000-2015. Aerosol optical thickness is a measure of how much light the airborne particles prevent from traveling through the atmosphere. Aerosols absorb and scatter incoming sunlight, thus reducing visibility and increasing optical thickness. Dark orange areas show high aerosol concentrations, while light orange areas show lower concentrations, and light yellow areas show little or no aerosols. Grey indicates areas where the MODIS sensor could not make its measurement. An optical thickness of less than 0.1 (light yellow) indicates a crystal clear sky with maximum visibility, whereas a value of 1 (dark orange) indicates the presence of aerosols so dense that people would have difficulty seeing the sun.